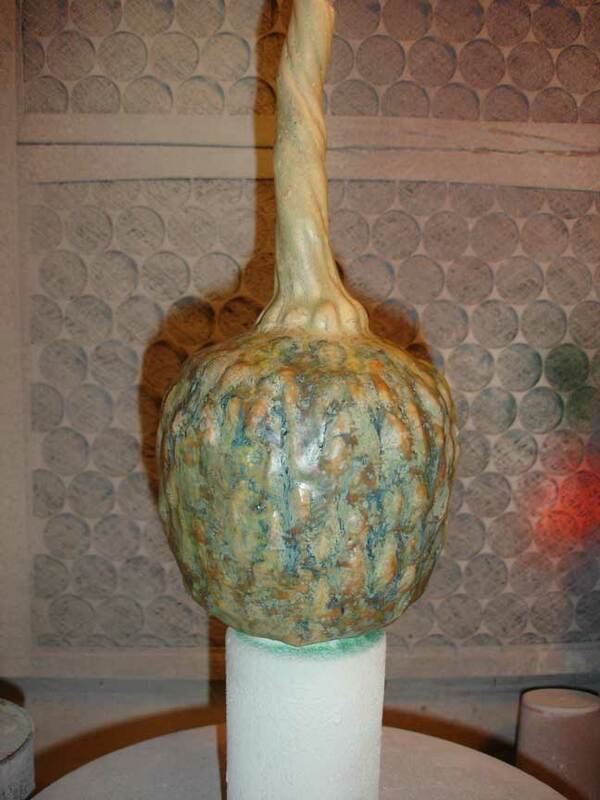 I have been glazing for most of the last month- until my kiln quit on me! Here are a couple of things I got out of the kiln before it quit. The piece below is a donation piece. 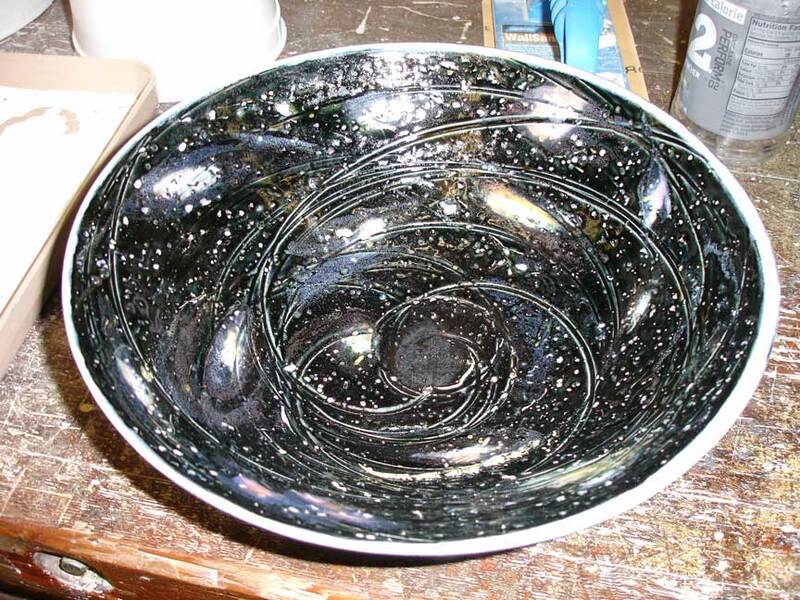 I call this my Hubble Bowl. I love it. I have one 23" plate that I made five years ago and never glazed. It is going to be a big Hubble Bowl. 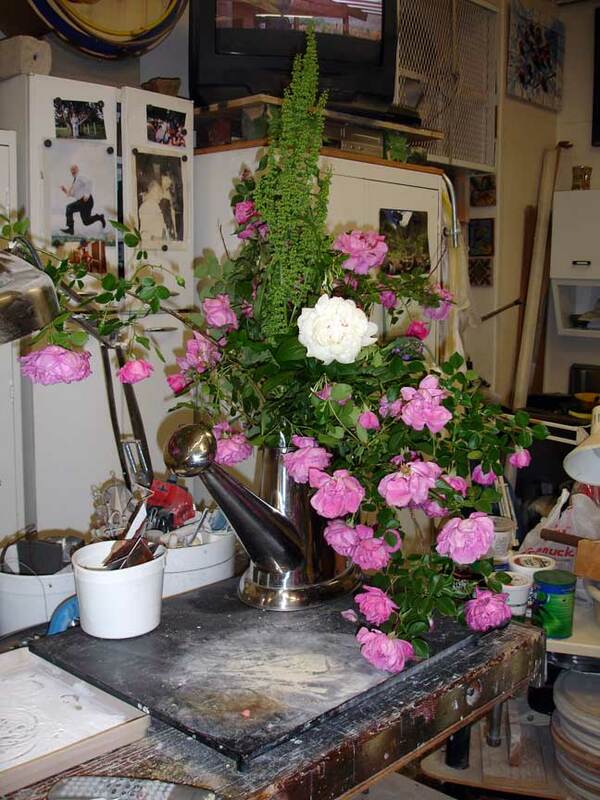 This is the other side of the pot pictured previously. 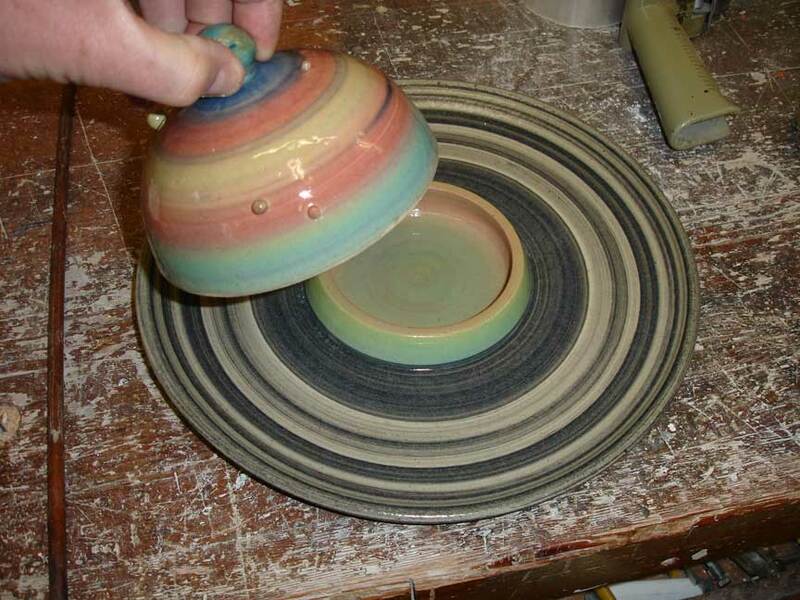 How is this for a killer glaze? 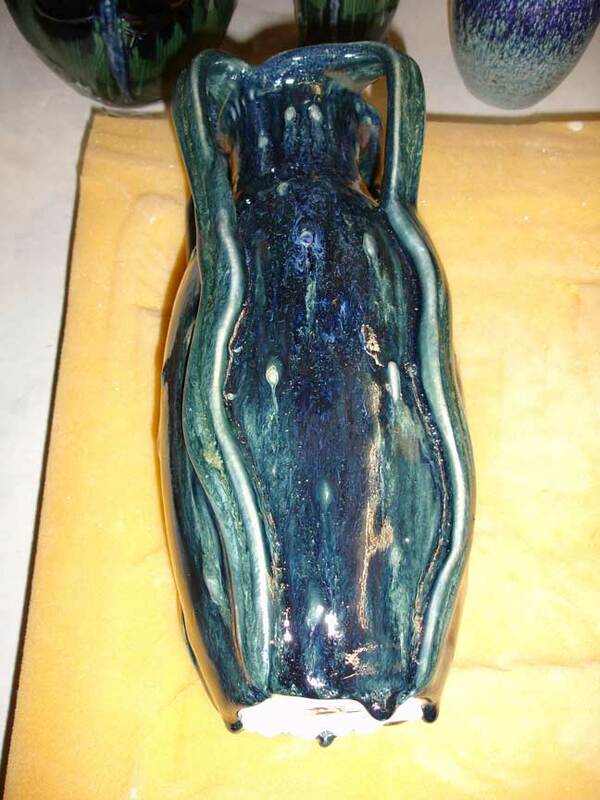 It is basically my "Jewel Glaze", but it has been fired four or five times. I am finally happy with it. Yes indeedy- very happy. 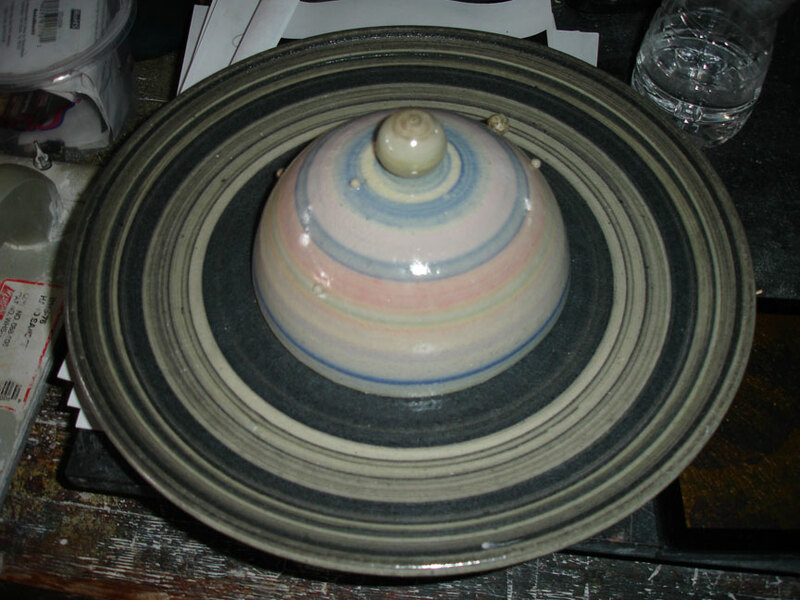 Here is one of the Saturn plates that was sent off to a friend. A Dragonfly that went horribly wrong. But just wait and see how I salvage this p[piece. It will be a miracle, but since I am "The Creator", I can do it. 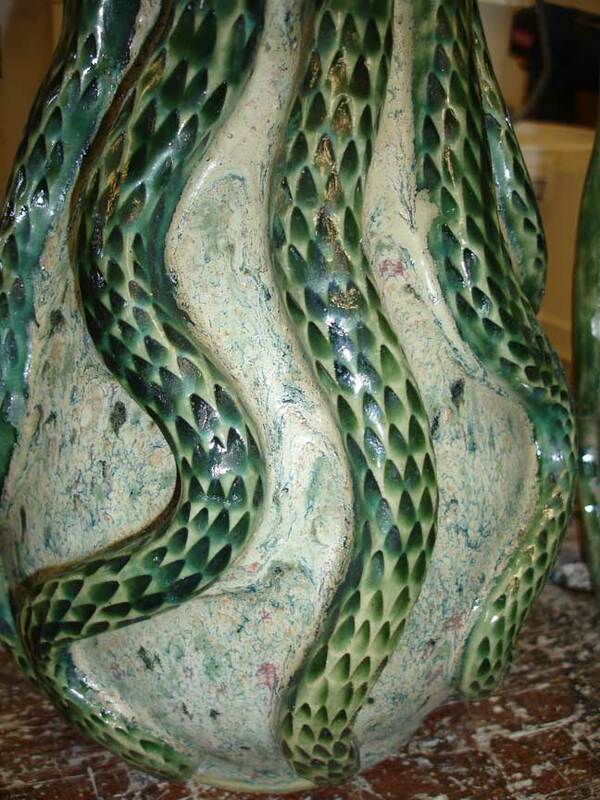 This is a recent Venom Pot with a green variation of my Jewel glaze. 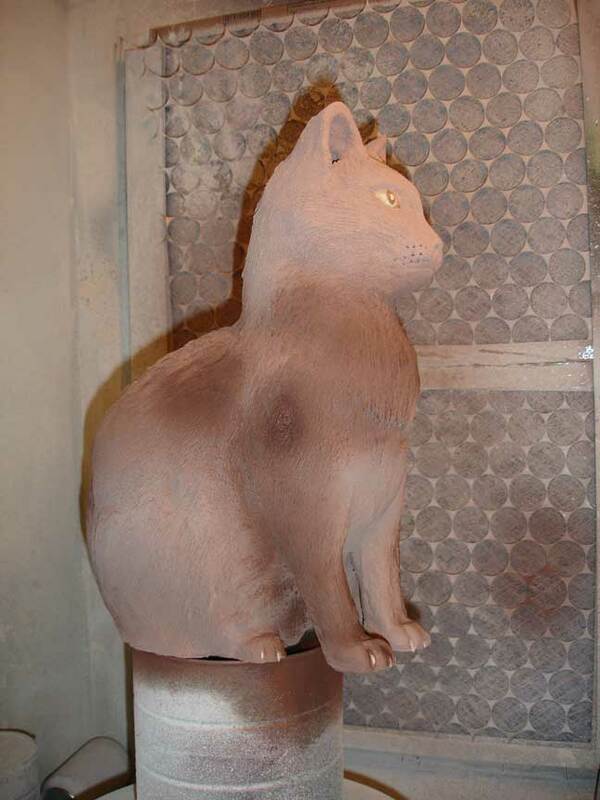 This cat is glazed and ready for the kiln. 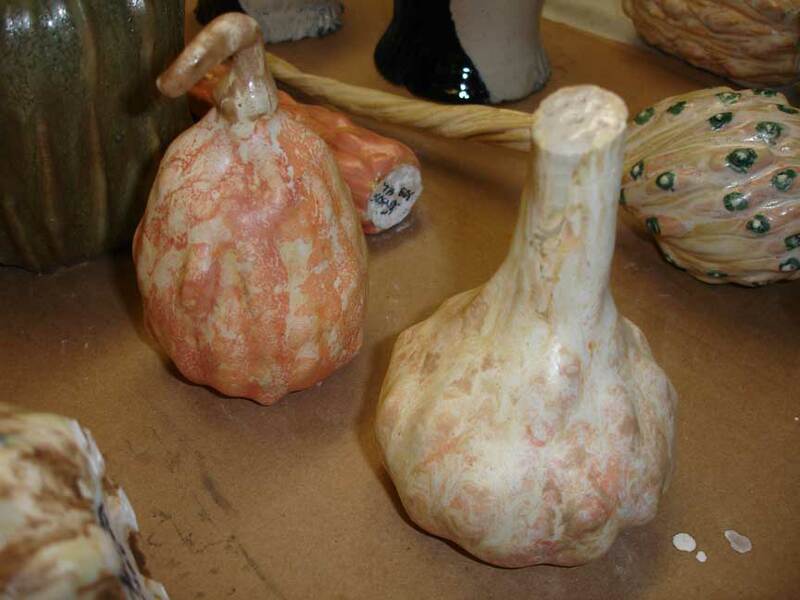 These are next in line for glazing. I expected this horrific glaze run. The pot looks good- better than what you see in this photo. I am constantly amazed how many times I fire the kiln. It seems I am always making up these cone packs. 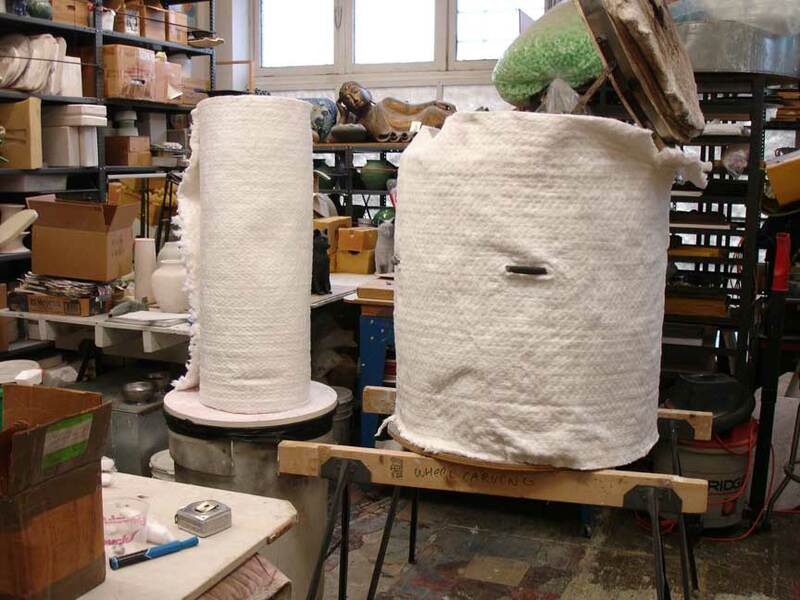 Cone packs visually tell you what temperature the kiln is inside. I have a thermostat that tells me the temp, but the thermostat cannot be fully trusted. 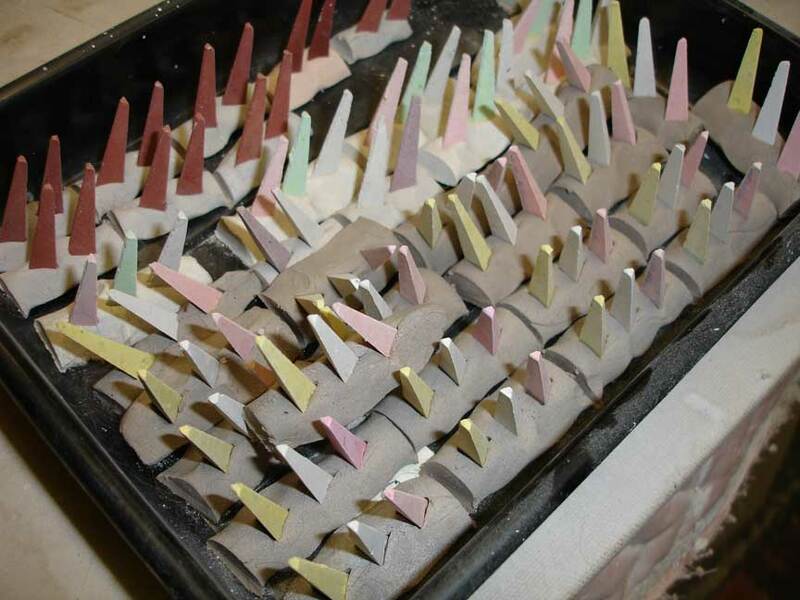 Cone packs are the sure bet as far as knowing what is going on in the kiln. Each cone falls at a different temperature. As they fall, you can read the temperature climb. On Mother's Day, I traditionally raid the alleys in my neighborhood. Any flowers on the alley side of a fence are fair game. 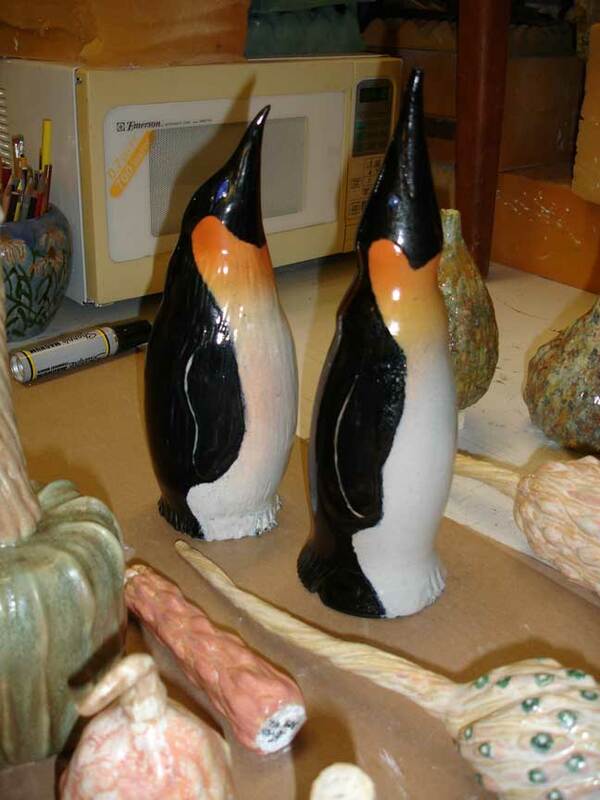 I made these two penguins about three years ago and finally got around to glazing them. 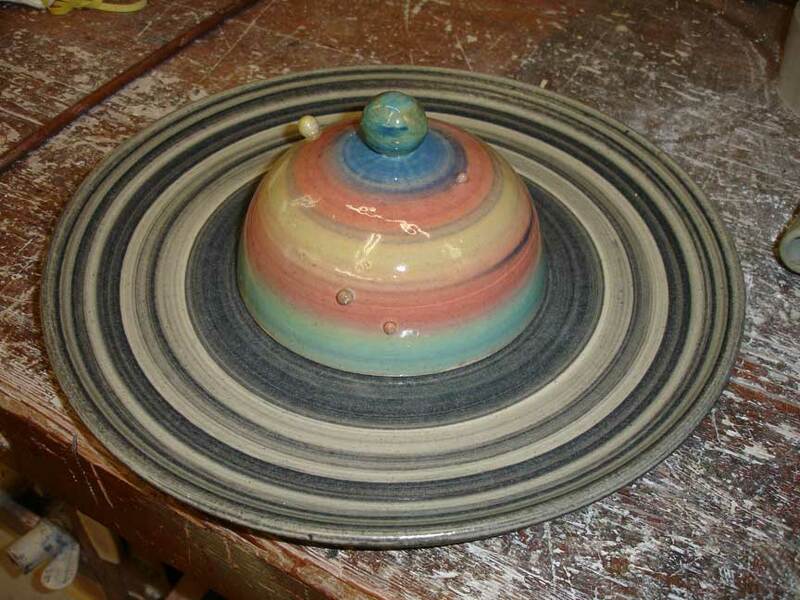 Here is another Saturn Chip and Dip plate. 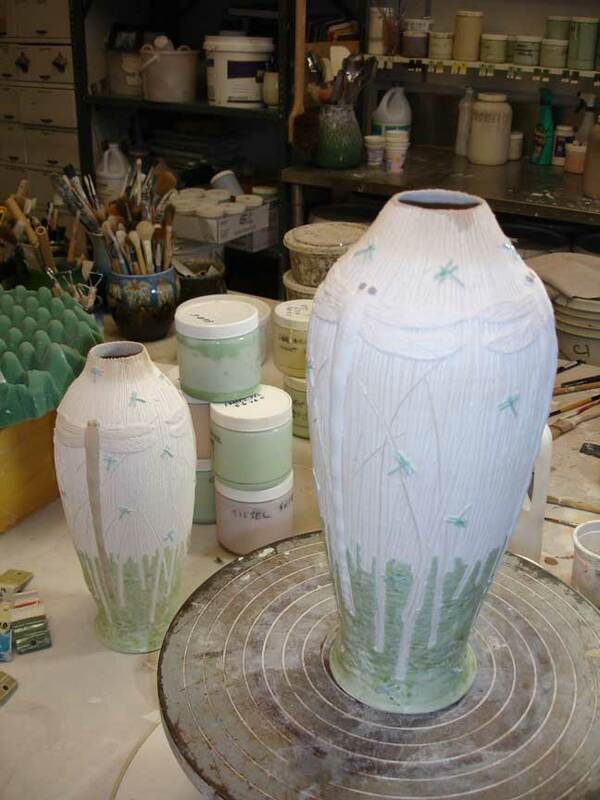 and a few big and new Dragonfly pots in the process of being glazed. 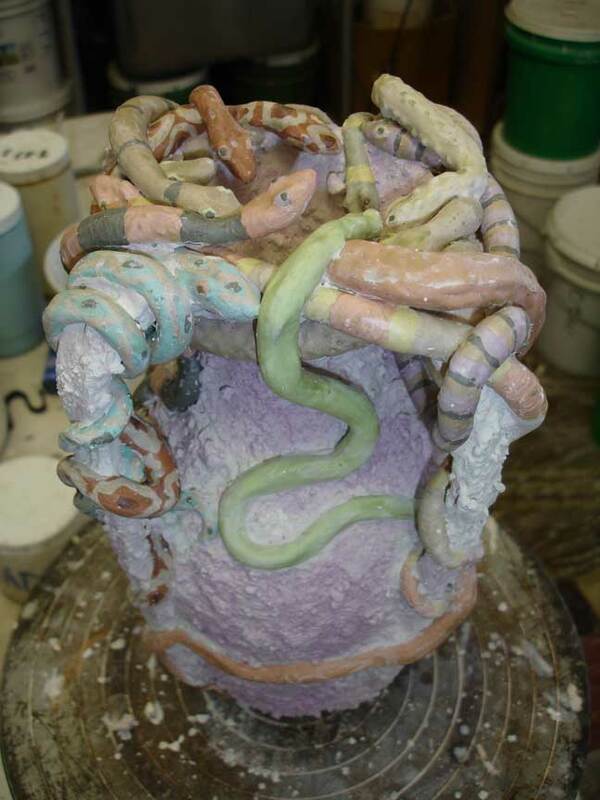 Now here is a snake pot made in the Anna Pottery tradition. It was a bugger to glaze- lots of little brushes and small marks. I am glad it is done. It was about to go in the kiln, but the kiln quit on me. 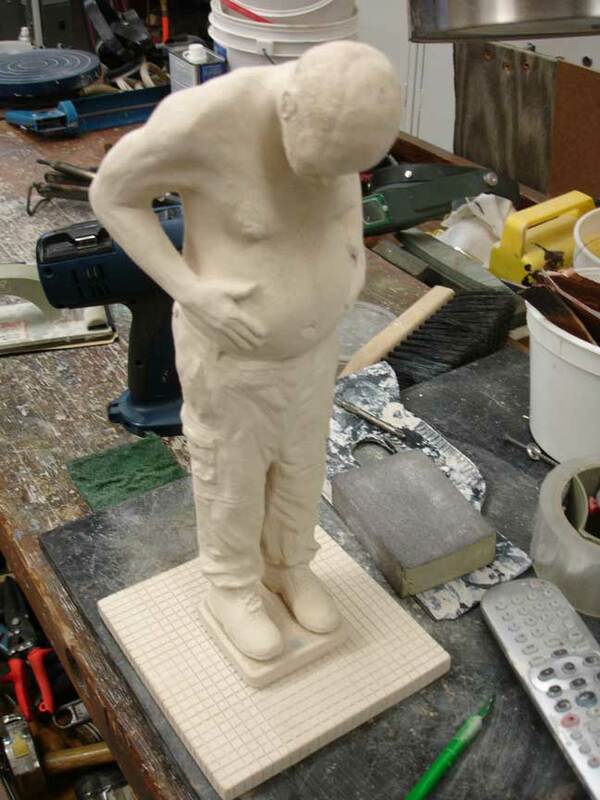 The last firing would not get to temperature and the kiln "stalled" at 2222 degrees F. My buddy, Rich, is pictured here looking at the patient. 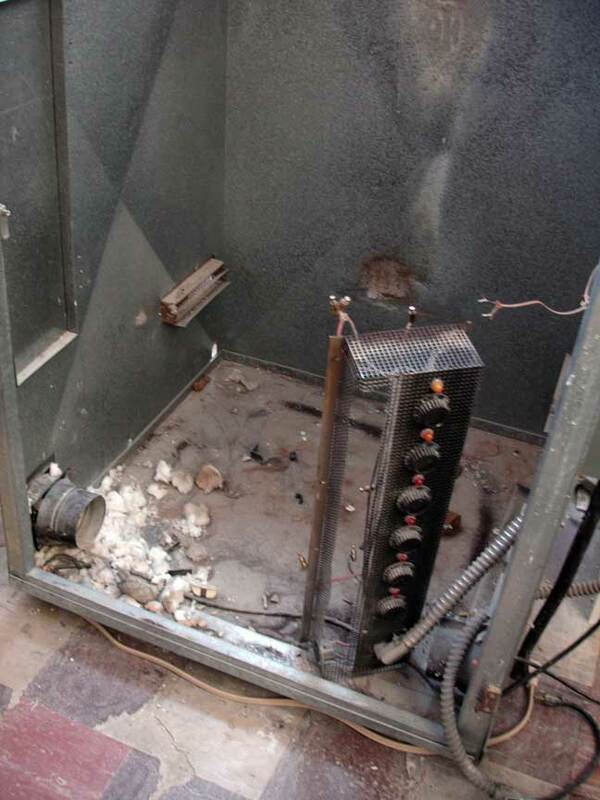 To put it bluntly, the kiln was a mess. 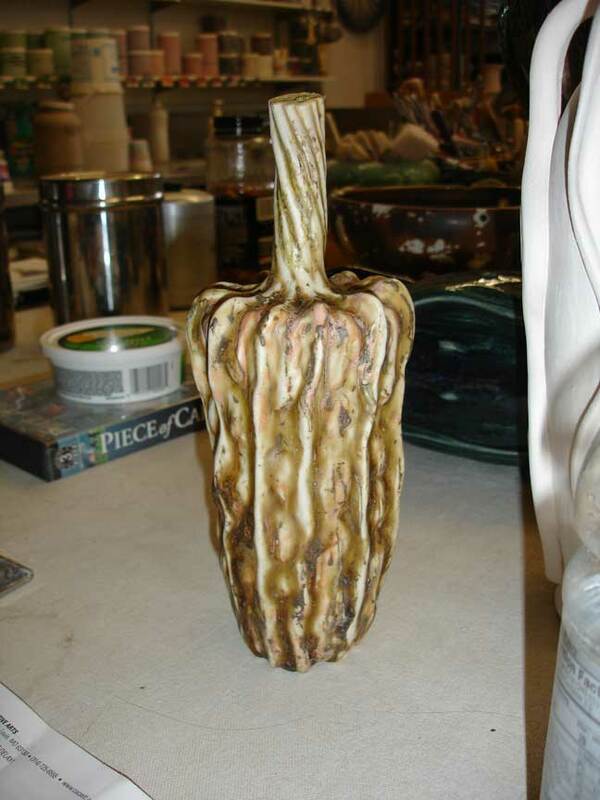 This is what it looked like when we pulled it from the Kiln Kontainer. 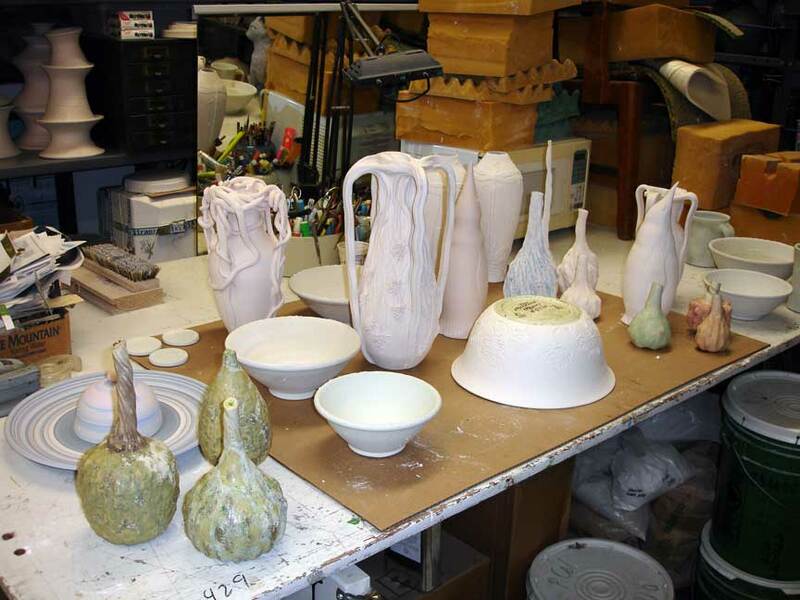 When I pulled the kiln out and started working on it, all available space in the studio disappeared. 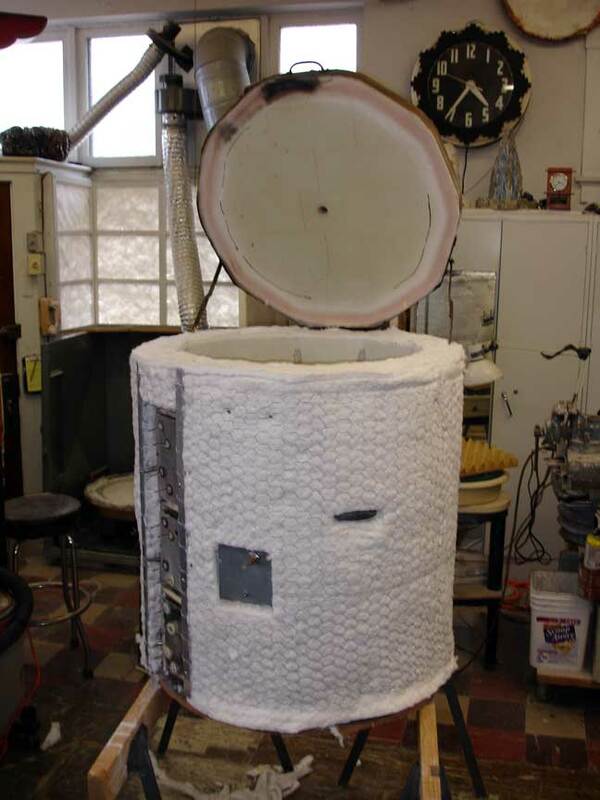 My kiln used to be an experimental gas and electric kiln. 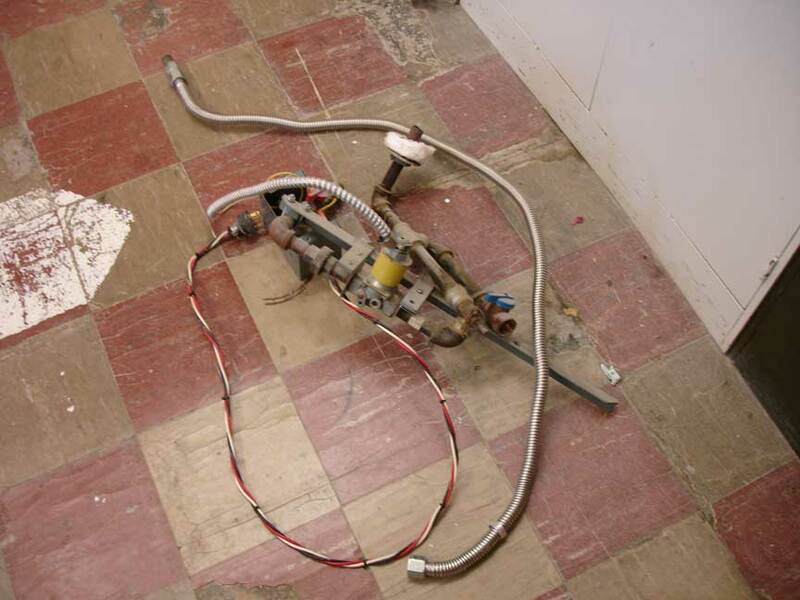 I removed the gas parts and now I am strictly electric oxidation. 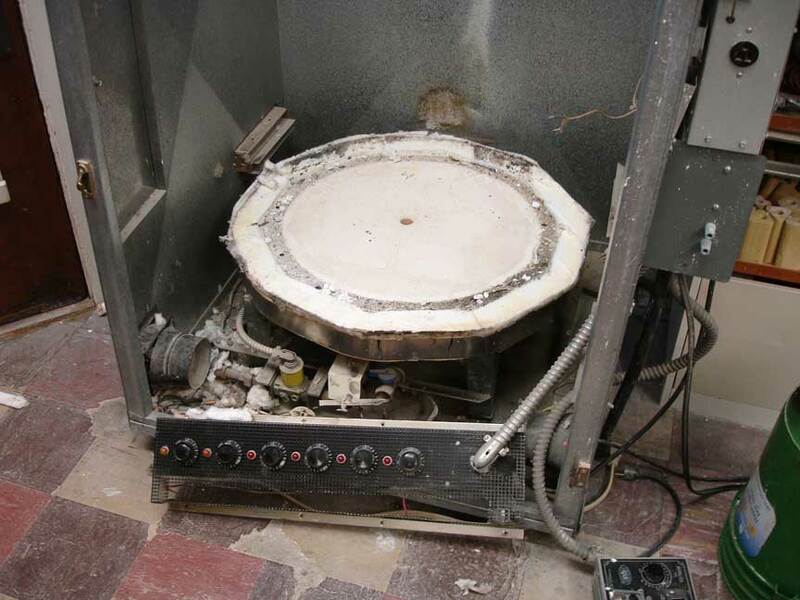 I had to band the kiln because the stainless jacket broke down. 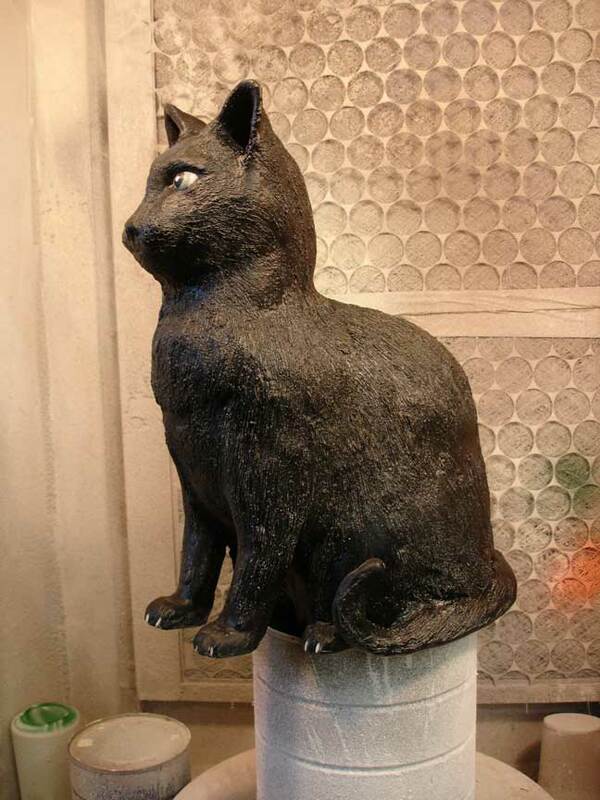 I have to admit that it broke down because of the way I used the kiln. 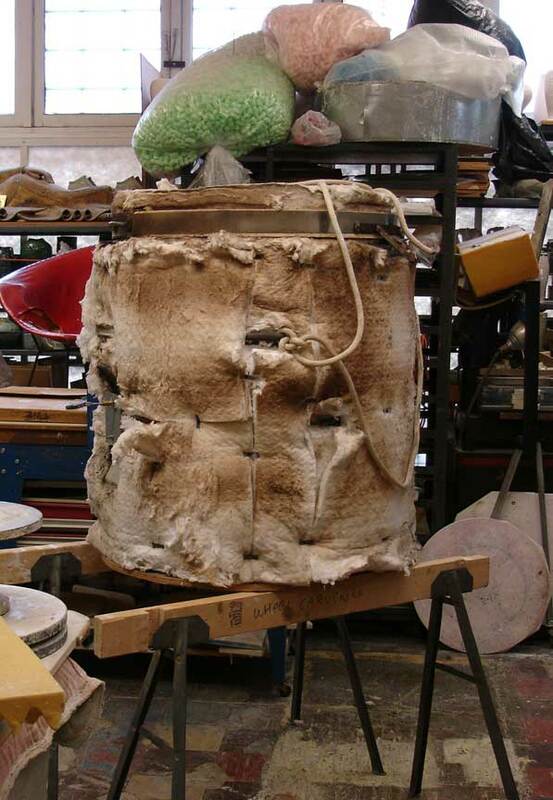 Normally you do not put insulation over the exterior of the kiln. 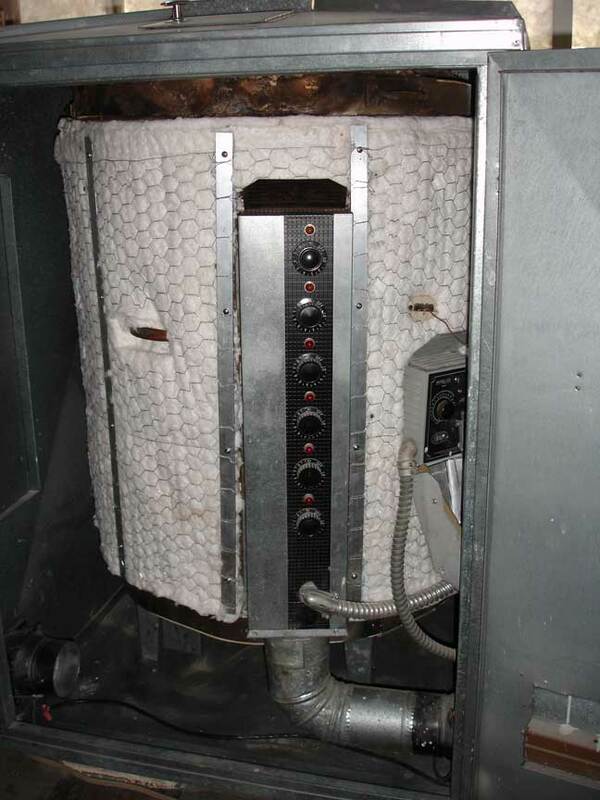 However, I wanted the increased power, speed and efficiency a well-insulated kiln provides. 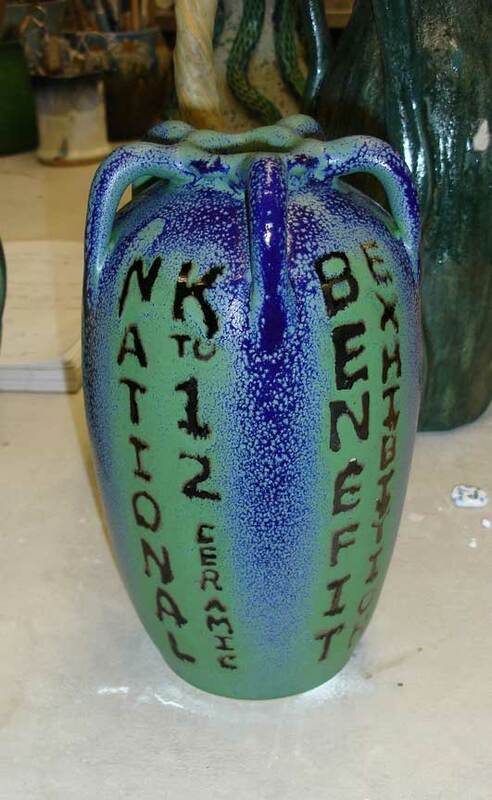 My buddy, Rich, says I use and I am as hard on the kiln as the colleges. I think that can be a compliment, but I am not sure. 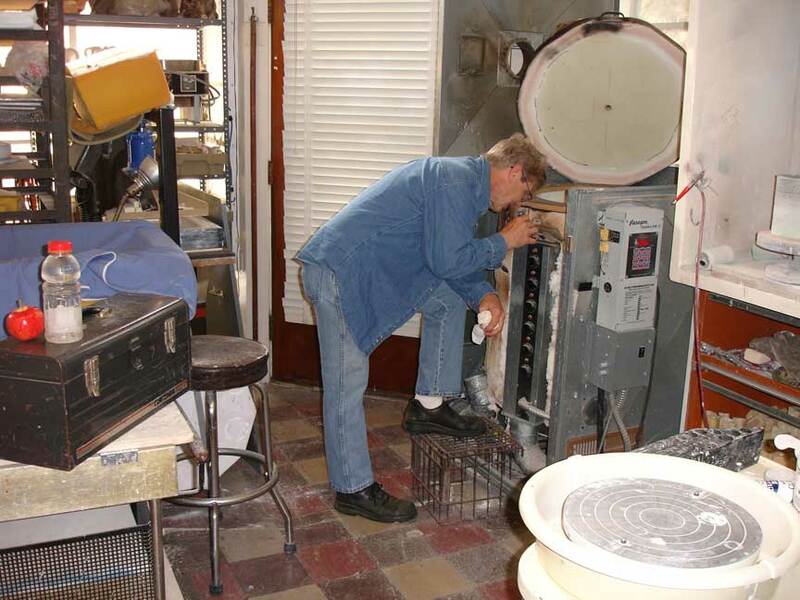 Here is the kiln doctor going to work. 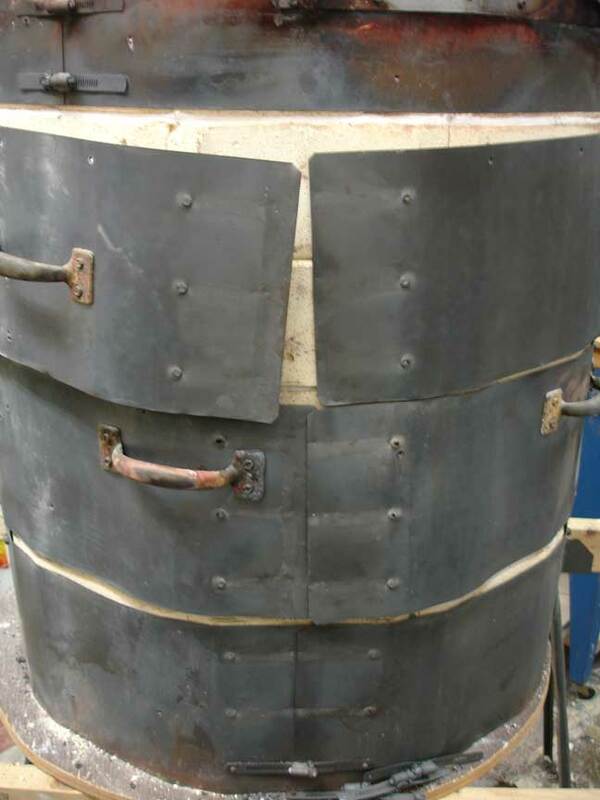 Note the stainless jacket repairs. 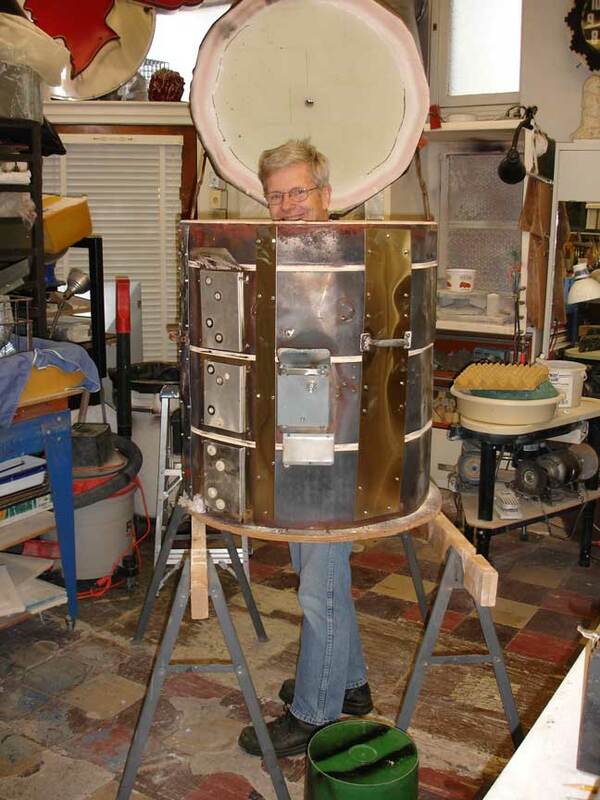 I told Rich that he could use the kiln as a Halloween costume. 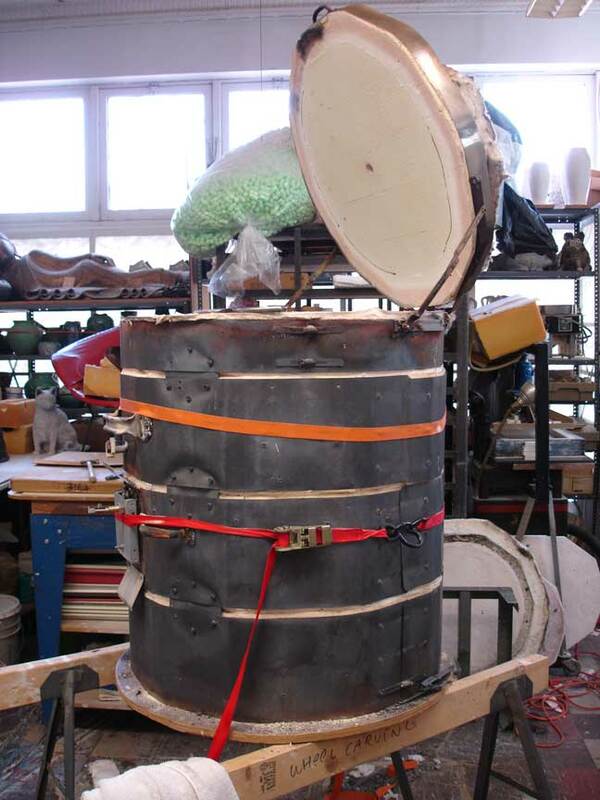 I always keep a set of kiln coils on had for just such breakdowns. Rich gave me a hand and installed them. 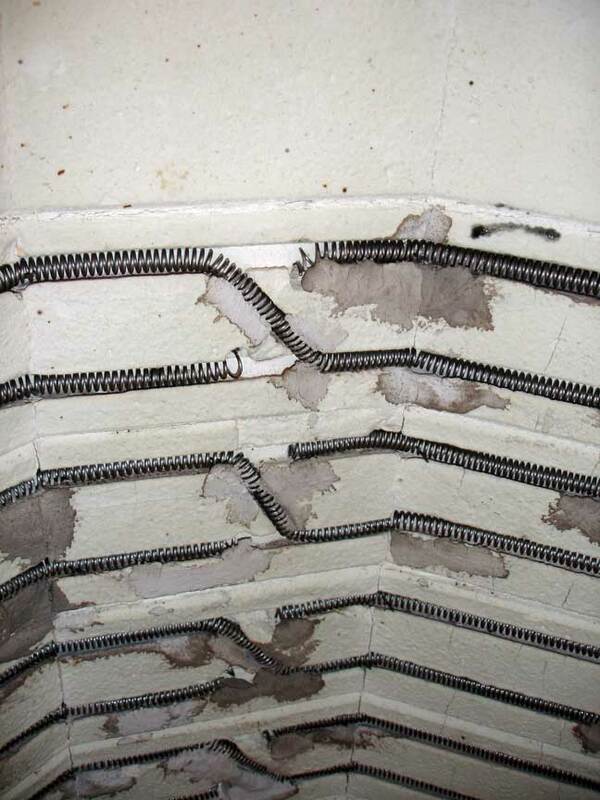 A lot of the kiln bricks needed minor repairs. 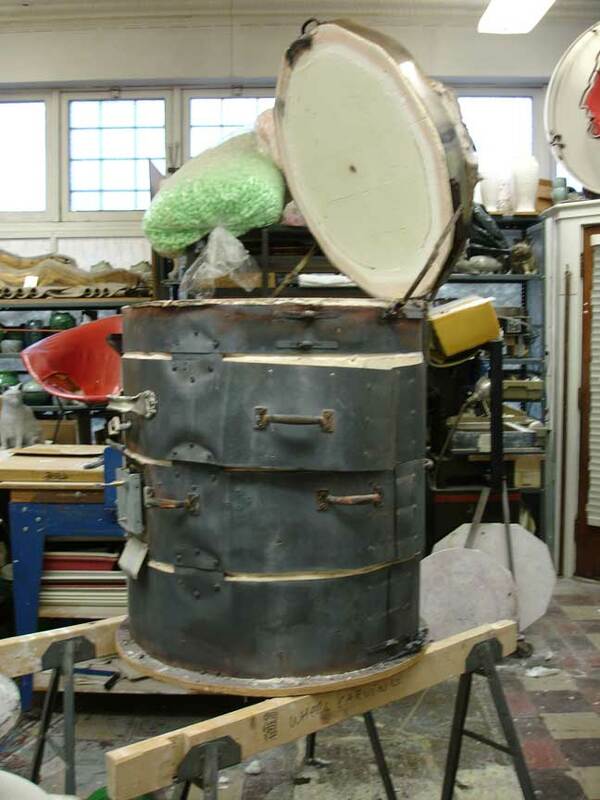 A couple of friends gave me a hand getting the kiln back in the container and I reinstalled all the controls. I did spend a little time assembling my "Damn" piece. The electronics in the base are installed and the scale has a flashing red LED between the feet. I could not coordinate my camera shutter with the flash of the LED. It does work beautifully. This piece is going to be painted rather than glazed. 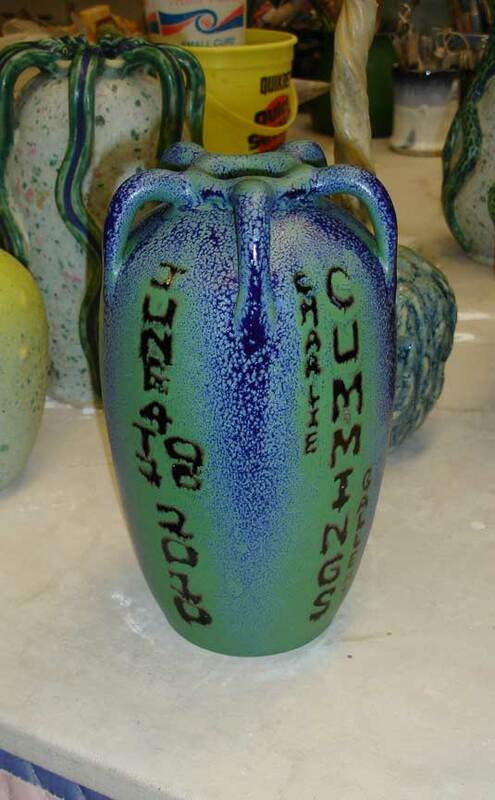 Next update should show the pieces that will be going to Zanesville- if I do indeed go. Check in, you might see something you just have to have!